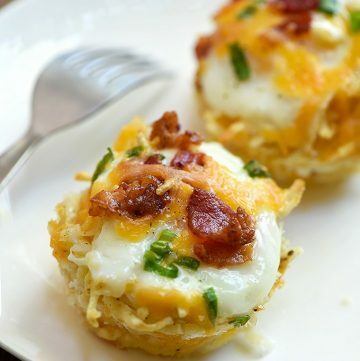 Eggs in a Nest with soft yolks, crisp bacon, cheese, and green onions baked in hash brown potato nests. They’re a delicious breakfast treat and totally portable for snacking on the go. Eggs in a nest are a delicious spin-off of one of our most popular recipes on the blog, avocado egg cups. But while eggs are baked in creamy avocado halves in the latter, soft yolks, crisp bacon, and green onions are now nestled in a golden, crispy bed of hash brown potatoes. 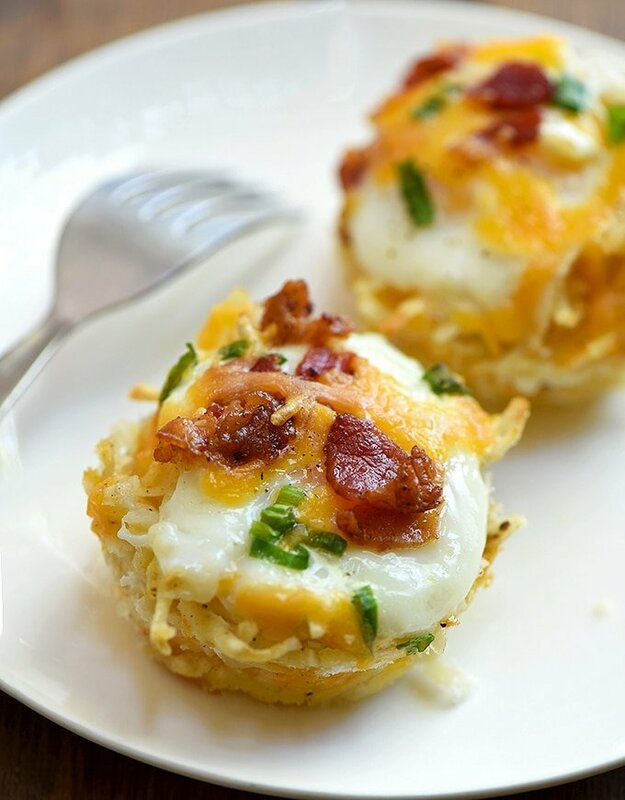 Breakfast can’t get any more scrumptious than these hashbrown egg cups. They’re delicious, conveniently portable, and a good source of protein and carbohydrates to start your day or just anytime you need a quick boost of energy. These baked eggs are as fun to make as they are to eat! So easy to pull together with a few staple ingredients you probably already have on hand, you can have a tasty batch ready in a cinch. 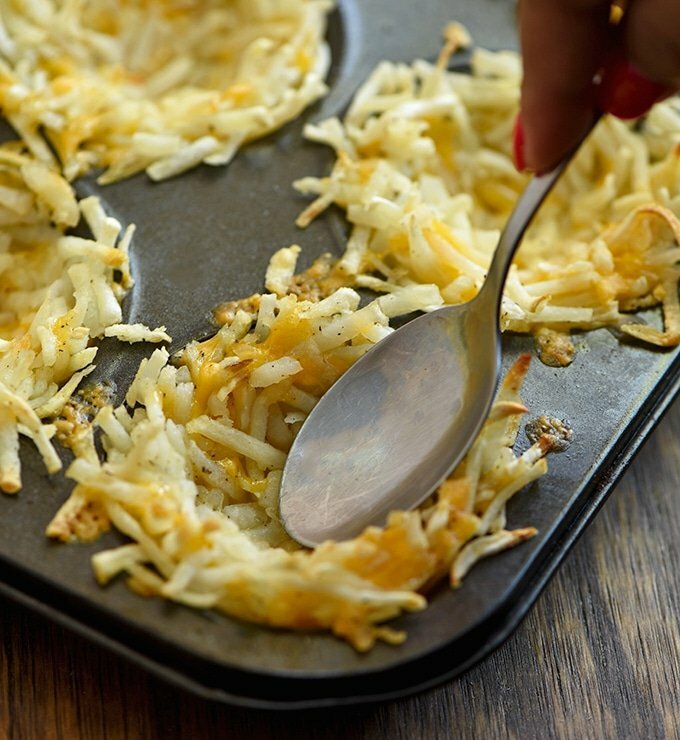 Make sure the hash browns are completely thawed as the excess moisture might keep the shredded potatoes from forming together. After the brief baking, press down the potato mixture with a spoon to make a deeper well. Generously grease the muffin holes with nonstick cooking spray and allow the eggs cups to cool slightly before removing to prevent them from falling apart. I think these eggs are best with soft, wet yolks but if you’re going to enjoy them on the go, I suggest baking them until at hard-cooked for less mess. Follow the suggested minutes below. Prefer quiche-style eggs? Beat them until frothy with a bit of milk and stir in the cheese and crisp bacon. Pour the mixture into the potato cups in place of whole eggs and bake until set. 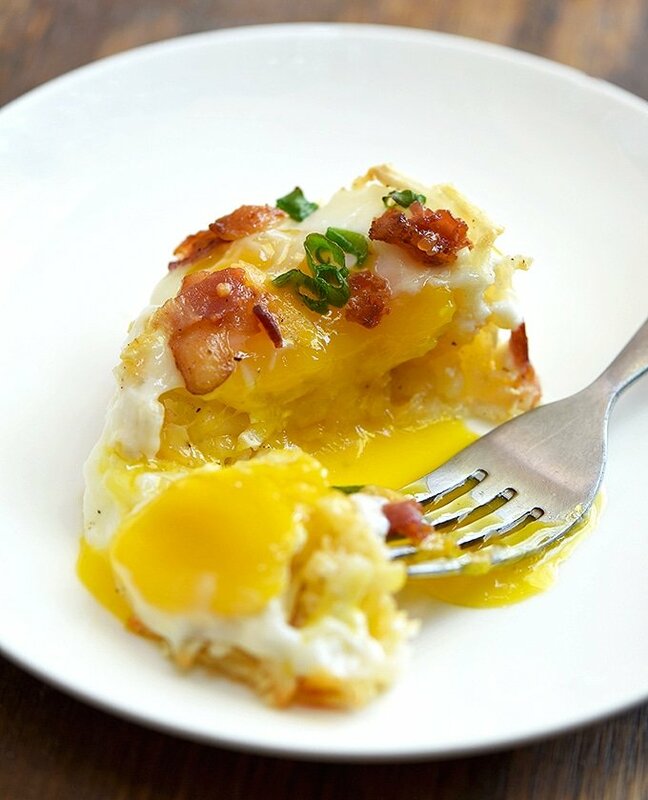 Give these eggs in hashbrown nests a try for breakfast or brunch. Double the recipe as they’re sure to be a hit with the family! Enjoy! 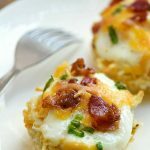 Eggs in a Nest with soft yolks, crisp bacon, cheese, and green onions baked in hash brown potato nests. They're a delicious breakfast treat and totally portable for snacking on the go. In a bowl, combine hash browns, 1 cup of the cheese, olive oil and salt and pepper to taste. Divide mixture into prepared muffin holes and using hands, press firmly onto sides and bottom of each muffin holes to form a "nest". 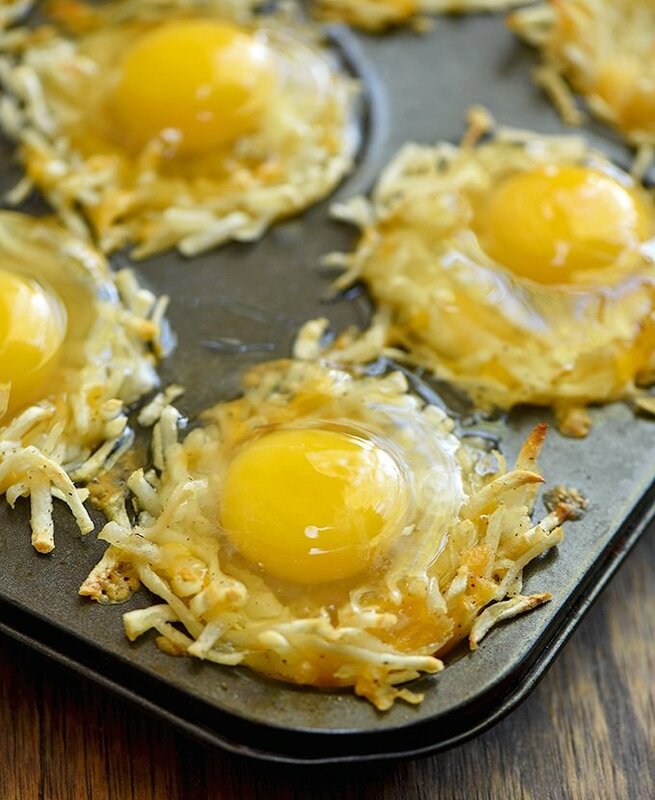 Bake in a 425 F oven for about 13 to 15 minutes or until hash browns are crisp and lightly browned. Using a tablespoon, press down on the potato mixture to create a deeper well. 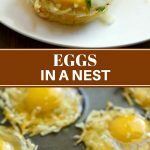 Crack one egg into each of the potato nests. 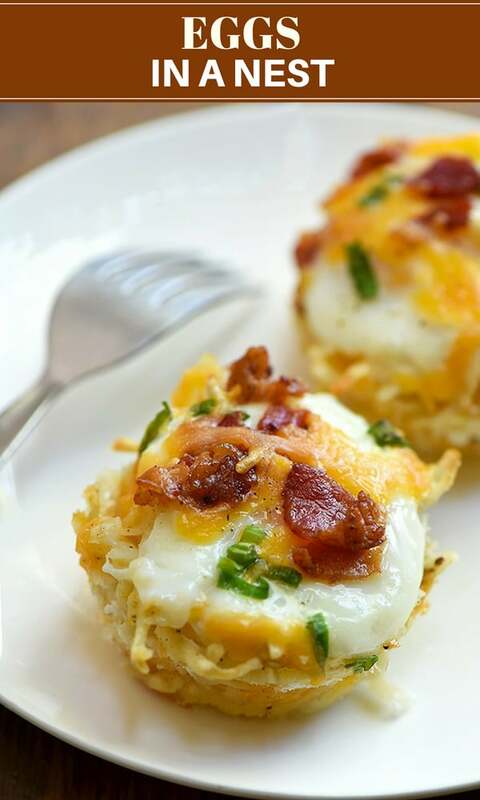 Top each egg with crumbled bacon, green onions and the remaining 1/4 cup cheese. Bake in a 350 F oven for about 13 to 15 minutes or until egg whites are set. Remove from heat and allow to slightly cool. Run a knife around the edges of each egg nests to loosen and gently lift off pan. I made these this morning and they were great! The only changes I made is, I put the thawed hash browns on a sheet tray and baked for about 5 min before I mixed everything to dry them a little for a crunchier nest. I also added tarragon to the hash browns due to preference. My family loved them! Hello, where is the recipe written for these Egg in a Nest? Thank you so much for letting me know, I didn’t realize the recipe card was missing from the post. Corrected now, I hope you enjoy the recipe. These egg treats are delicious! Omg can we say yum?!? I just give your recipe a try! I just tried to make these and a few minutes after I took them out of the oven they collapsed. Can you give me any tips to prevent that. They tasted delicious! Do you mean they fell apart? Just let them cool a little so they’ll be easy to pry from the muffin tin. This looks so yummy and it would be perfect for my Nutrisystem diet flex meals. Must try it. Thanks, Bethany! I hope you enjoy this! I was never a fan off breakfast. I am just blown away by how much cholesterol is in this. As a vegan we dont eat any cholesterol, so i am used to nutritional guides saying 0mg cholesterol. In my opinion this is nutritional —so if you don’t like this wonderful, great tasting breakfast , don’t eat it ! These look delicious! We love breakfast around here so I’ll definitely have to try these. They look easy for the kids to eat too. Thanks, Danielle! I hope the whole family will love this! This looks perfect for breakfast! I bet my kids would love them. It sounds like a filling breakfast! It’s definitely yummy to look at! I’m sure this one’s going to be a hit with the kids! Oh my goodness! I really wanted to try it. It looks tasty and tempting. You will love this, Karlyn! How amazing do these sound! They’re not too heavy on the calories either – a perfect protein-packed breakfast! This looks SO VERY GOOD! I love making soufflé and quiche and this is right in that area! I am totally making these! I so need to do this. I am always on the go and need things that are quick and easily and ready to eat on the go. These look so delicious! I am a total protein junkie and I love eggs with breakfast meat! These would be the perfect breakfast for me! These are so cute, and I love that it’s a one-stop breakfast for several people all at once. Perfect for brunch when you’ve got company, or as breakfast-for-dinner with parfaits and some breakfast meats on the side! It is so versatile, Brandi! Thanks a lot! I was hooked when I tried this and so is hubby. Very tasty and goes great with coffee! By the way, you forgot to add the eggs in the ingredients. Otherwise, very easy to follow recipe and definitely a keeper!